Angela Adams is largely known for her bold textile design, but more recently she's expanded her line to include clean-edged modern furniture. Her latest collection, The Birds and The Bees, features deeply textured and piled rugs reminiscent of the forest floor, but its her furniture pieces that are a decided contrast to the whimsical stories the rugs weave. 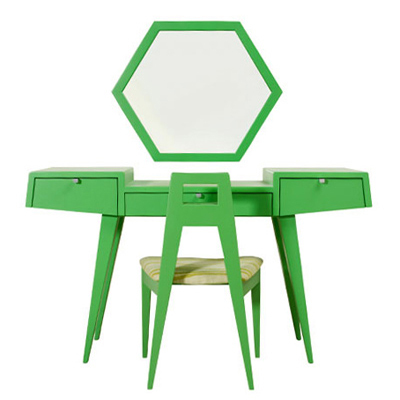 For instance, a piece like the Lily Dressing Table (above) is a cross between very serious Swedish modern and a praying mantis. Its sleek lines and glossy finish would be harsh in any context other than a room full of her patterns. The Blackbird Desk (below) has its own connotations (can you guess?) but is still at the end of the day simple and modern with just a hint of the playfulness we expect from her. See more by Angela Adams here.